Analysis: McKenzie left the game for a spell to be evaluated for a head injury, but he's been cleared and will now look to make his mark in the Buffalo offense in the second half of Sunday's contest. Analysis: Prior to his exit from the contest, McKenzie did not have a catch in the game. Robert Foster and Zay Jones are currently the Bills' top healthy wideouts. Analysis: It actually looked like McKenzie's season was over when he was carted off the field Sunday against the Lions, but it turned out to be a more minor injury combined with some cramping, so he'll almost certainly be back at it for Week 16's contest in New England. McKenzie has been used in a hybrid role you see a number of offenses utilizing these days, as a third receiver, occasional jet-sweep guy, and return man. Analysis: Carted off the field during the third quarter of Sunday's 14-13 win over the Lions, McKenzie surprisingly made it back into the contest and finished as the team leader in targets (seven) and receptions (six). He seems to be on track for Week 16 at New England, but even the slightest of limitations would be a major concern for an undersized player who largely relies on his excellent speed and agility to generate yardage through the air or on the ground. McKenzie caught six of seven targets for 53 yards and rushed once for four yards in Sunday's 14-13 win over the Lions. Analysis: McKenzie was carted off with a non-contact injury in the third quarter, but managed to return to the game. Seeing as McKenzie avoided a serious injury on the play, look for Buffalo to try to get the ball into the speedy playmaker's hands in Week 16 against the Patriots. McKenzie rushed four times for 22 yards and a touchdown while catching four of seven targets for 47 yards in Sunday's 27-23 loss to the Jets. Analysis: McKenzie got some looks as a rusher and made the most of those opportunities after both LeSean McCoy (hamstring) and Chris Ivory (shoulder) were forced out by injuries. His longest run was a 15-yarder, which also culminated in a touchdown late in the first quarter. Should both McCoy and Ivory sit out against the Lions in Week 15, McKenzie would likely steal a few carries from Marcus Murphy. McKenzie (toe) is active for Sunday's game against the Jets, Chris Brown of the Bills' official site reports. 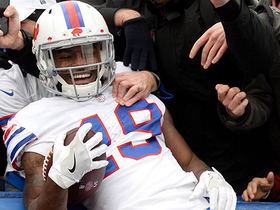 Analysis: McKenzie and Robert Foster are now the clear-cut top depth options at receiver behind Zay Jones now that Kelvin Benjamin and Andre Holmes have been discarded. With that in mind, the odds are good McKenzie gets a larger number of offensive snaps the last four games of the season. He'll also see work in the return game. McKenzie (toe) practiced on a limited basis Friday and is listed as questionable for Sunday's game against the Jets. Analysis: McKenzie wasn't able to put in full work in the Bills' final session of the week after injuring himself a day earlier. The 5-foot-7 speedster is expected to step in as the Bills' No. 2 or 3 receiver over the final quarter of the season with Kelvin Benjamin and Andre Holmes out of town, but he'll miss out on at least one chance to seize the opportunity if he isn't able to rally in time for Sunday. The fact that he was able to practice in some fashion Friday is probably a good sign, however. McKenzie (toe) was listed as limited at practice Thursday. Analysis: McKenzie injured his toe during Thursday's session and was unable to finish practice, which clouds his status for Sunday's game against the Jets. If he's unable to go this weekend, added snaps in the Bills' thinned-out receiving corps (behind top options Zay Jones and Robert Foster) would be available for Deonte Thompson and Ray-Ray McCloud. Coach Sean McDermott confirmed that McKenzie suffered a toe injury during Thursday's practice and was unable to finish the session, Jay Skurski of The Buffalo News reports. Analysis: The early departure from the session will likely result in McKenzie being listed as a limited practice participant, but perhaps of greater significance is that the wideout is slated to undergo further evaluation. That hints at the possibility of McKenzie's injury being something that could sideline him for Sunday's game against the Jets, a scenario that would open up more opportunities for lightly used rookie Ray-Ray McCloud. McKenzie "came up limping" after running a route during Thursday's practice, Joe Buscaglia of WKBW.com reports. 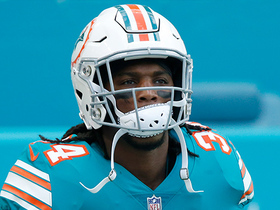 Analysis: Per the report, after hobbling to the sideline the wideout slammed down his helmet in frustration, so this is a situation to watch, especially with the Bills having parted ways with both Kelvin Benjamin and Andre Holmes earlier this week. 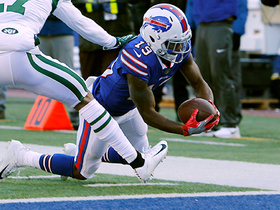 McKenzie brought in all four of his targets for 46 yards, returned two kickoffs for 31 yards, and netted zero yards on his sole punt return in the Bills' 21-17 loss to the Dolphins on Sunday. McKenzie caught two of three targets for 11 yards and ran twice for eight yards and a touchdown in Sunday's win over Jacksonville. Analysis: McKenzie also returned three punts for 13 yards and two kickoffs for 43 yards. It's hard to put value on all that other than the touchdown, but it's become clear the Bills love McKenzie's speed and are already finding ways to use it two weeks into his tenure with the team. Perhaps most surprising is McKenzie saw action on 57 percent of the Bills' offensive snaps while mainstay Kelvin Benjamin logged just 40 percent. The newcomer will certainly get more looks over the final five games. McKenzie, picked up by the Bills a week ago, had five of the six returns in Sunday's win over the Jets. He had four punt returns for 42 yards (10.5 average) and had the team's only kickoff return for 33 yards. McKenzie also had three carries for 32 yards and one catch for 14 yards. 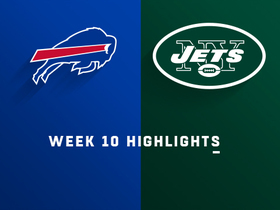 Analysis: Considering the Bills won the game in large fashion and McKenzie looked better than any other option the team has tried lately, all to go with the notion they would prefer not to use starting safety Micah Hyde on punt returns, it looks like these will be McKenzie's jobs to run with once the Bills come off their Week 11 bye. The offensive output was mostly the result of a garbage-time situation, but it looks like the Bills may have gotten the return man they've been searching for. 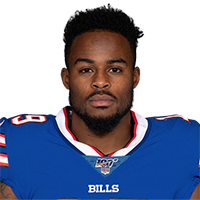 McKenzie was claimed by the Bills on Monday after being waived by the Broncos on Friday, Mike Rodak of ESPN.com reports. Analysis: McKenzie likely walks into a better situation than the one he left, given that the Bills may have the worst wide receiver corps in the league. However, since he'll likely start out sixth on the depth chart and plays for a team that can't move the ball, he's still miles away from being a fantasy consideration. McKenzie was cut by the Broncos on Friday, Nicki Jhabvala of The Athletic reports. Analysis: McKenzie was cut to make room for fellow wideout River Cracraft on the active roster. The second-year pro will look for a depth role elsewhere in the league and could conceivably find work as a kick returner. McKenzie (hip) is absent from Wednesday's injury report. Analysis: McKenzie was forced out of Denver's loss to the Chiefs in Week 8 due to a hip injury, but appears to have fully recovered. Barring any setbacks, expect McKenzie to suit up as a depth receiver and kick returner against the Texans on Sunday. McKenzie was forced out of Sunday's 30-23 loss to the Chiefs due to a hip injury, Zac Stevens of BSNDenver.com reports. Analysis: McKenzie was promoted to Denver's 53-man roster less than a week before the Week 8 contest in which he suffered a hip injury. The second-year pro will look to get healthy in time for the Broncos' matchup against Houston in Week 9 and is likely competing to maintain his roster spot. The Broncos signed McKenzie off their practice squad Thursday, Mike Klis of 9News Denver reports. Analysis: McKenzie signed to the Broncos' practice squad Sept. 12 and finally got promoted to the 53-man roster Thursday. The Georgia product could immediately fill in on both kick and punt returns in some capacity. If rookie DaeSean Hamilton (knee) is unable to go Sunday, McKenzie could also see snaps at wide receiver. McKenzie was signed to Denver's practice squad Wednesday, Nicki Jhabvala of The Athletic reports. Analysis: McKenzie spent the offseason competing for a role as Denver's kick returner, but lost out to rookie Phillip Lindsay and veteran Adam Jones. Since being selected in the fifth round of the 2017 NFL Draft, McKenzie has failed to carve out a role either on special teams or as a depth receiver. He could stick with the Broncos' practice squad for the near future, but is a longshot to secure a relevant role on the team's offense. McKenzie was waived by the Broncos on Monday, Zac Stevens of BSNDenver.com reports. Analysis: McKenzie failed to carve out a role as the Broncos' punt returner, losing out to Adam Jones. A 2017 fifth-round selection, McKenzie will work to earn a depth role elsewhere in the league if he clears waivers. McKenzie was re-signed by the Broncos on Sunday after originally being cut Saturday. Analysis: McKenzie will remain in Denver after a spot on the 53-man roster became available with safety Su'a Cravens (knee) headed to injured reserve. McKenzie, who was a fifth-round selection in 2017, will look to carve out a role as the team's punt returner while he's currently buried on the depth chart at wide receiver. McKenzie is listed as Denver's top punt returner but is buried on the first depth chart at receiver, the Broncos' official site reports. Analysis: McKenzie is, at best, the Broncos' No. 7 receiver at this point, but special-teams value means a lot when filling out the bottom of the roster. The problem for McKenzie might be that he has a history of bobbled punts, and River Cracraft, the No. 2 punt returner, is ahead of him on the receiver depth chart. It will be interesting to see how the club's emphasis on offense and special teams balance out. McKenzie played in the slot with the first team during OTAs, Andrew Mason of the Broncos' official site reports. Analysis: The reps came with Demaryius Thomas and Emmanuel Sanders both resting, but the work is still somewhat surprising given McKenzie's error-filled rookie season. The former Georgia Bulldog ended up with more fumbles (six) than offensive touches (five). He might still be lower on the depth chart than rookies Courtland Sutton and DaeSean Hamilton, but the fact that he appears to be ahead of fellow 2017 draft pick Carlos Henderson provides a solid early indication of his likelihood of making the team. McKenzie snagged four of 13 targets for 29 yards in 2017 and added a four yard rush. He fumbled six times during the season, losing two. 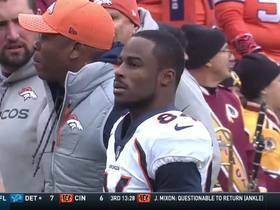 McKenzie will be inactive for the Broncos' Week 11 matchup against the Bengals, Troy Renck of Denver 7 News reports. Analysis: It is unclear why the Broncos have opted to sideline McKenzie, but he has lost fumbles in two of the previous three weeks. Jordan Taylor will return punts in the rookie's absence. 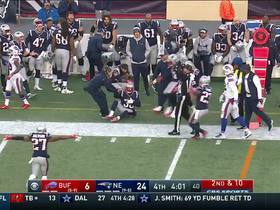 New England Patriots cornerback Jason McCourty keeps both feet in bounds as he intercepts a pass thrown by Buffalo Bills quarterback Josh Allen. 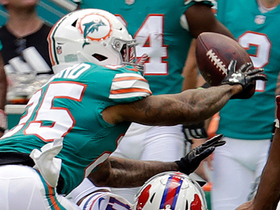 Buffalo Bills wide receiver Isaiah McKenzie muffs the punt and Miami Dolphins running back Senorise Perry grabs the ball for a Miami Dolphins fumble recovery. 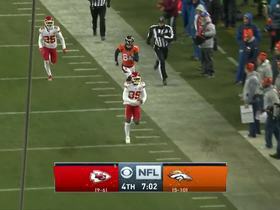 Denver Broncos quarterback Paxton Lynch's second interception comes in the red zone. 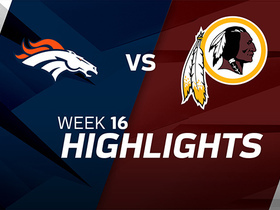 Watch the best plays from the Week 16 match up between the Denver Broncos and the Washington Redskins. The Denver Broncos come up short before halftime after costly mistake by wide receiver Isaiah McKenzie. 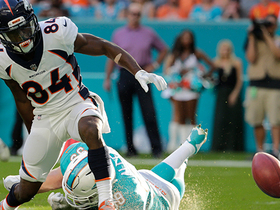 Denver Broncos wide receiver Isaiah McKenzie fumbles the ball in the end zone, and the Miami Dolphins recover for a safety.